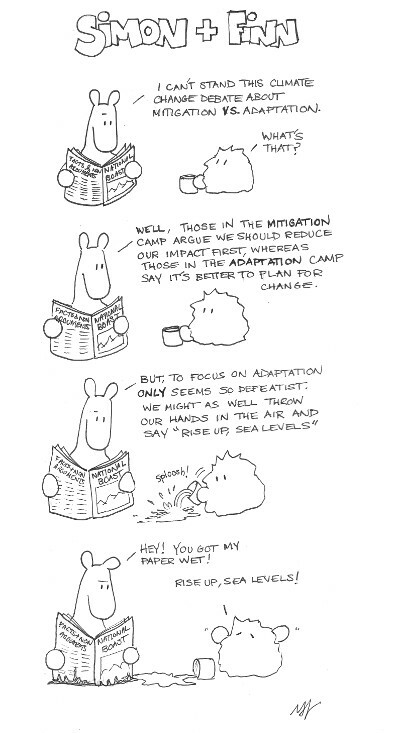 This entry was posted in S&F Cartoons only, Sciency stuff and tagged adaptation vs mitigation strategies, climate change adapation and mitigation, climate change debate, climate change joke, philosophy webcomic, simon and finn by simonandfinn. Bookmark the permalink. I like the end. Funny! Subtle but in your face. Heh.. that’s perfect.. subtly in your face… like maybe something in one’s eye. I recently heard from a friend, who attended another environmental event, that someone from the audience, who was actually involved in organising the environmental event, asked “is climate change linked to human emissions?” It’s quite amazing, really, how some people manage to remain in such blissful ignorance! As for my personal experience, I noted a couple of years when I attended what I expected to be a sustainability event, that there has been a shift in that part of the industry from the pursuit of sustainability to the pursuit of resilience. In a way, it confirmed my personal shift in beliefs for the world and for my own beliefs: resilience is really the key to survival of any duration, and it is the key to contentment. As for the CC mitigation and adaptation debate, wouldn’t the point be moot if people realised and got on with adapting in such a way that mitigates the situation from getting worse?! That’s funny about that question, yet I think it’s great that people without a lot of traditional interest in the area are bothering to go find out more. As far as resilience, I agree in that it is always a good idea, but to practice simply resilience without trying to fix or address the problem in some form to me seems odd. In terms of climate change anyway, as at least some kind of mitigative strategy would also have positive benefit for other things like air, water etc.. Interesting discussion on words given to concepts, for sure! Resilience to me is more than adaptation and mitigation together. To me, it speaks to the whole system thinking, including looking at the past, the present, and the future, but without getting lost in silo-ising these – to me, resilience is about good old common sense. So, I think we definitely agree on the concepts behind the words, and putting words to concepts is where things typically tend to go sideways 🙂 Would you agree? I agree with you on the resilience piece/definition, although to me it still seems like something is missing as I’m not sure how much prevention plays a role. That said, it could be semantics as you point out as others might see that resilience as including and addressing the current (i.e. prevention). Does Simon’s paper say: “National Boast” and “Facts & Non-Arguments”? A little challenging to make out, but if that’s what it says, then that’s funny too!! I like spreadsheets! All those little numbers, following their marching orders. But, one doesn’t typically hear them called beautiful I would hazard, even though they can be. The cartoon is very clear, and very satirical with respect to a mainstream media, hot-air source. Hot air source.. that’s funny. I’m picturing big puffy balloons.